Farmer Bob Knight of Old Grove Orange in Redlands, CA., lunching with some satisfied customers. It started small, with 20 elementary schools eating fresh local lunch every Thursday. Now, San Diego Unified School District’s farm-to-school menus are being served up at over 220 schools in the district to 132,000 kids. The ultimate goal is to have all 26 million meals a year be fresh, local and made from scratch, and district officials believe it can be done. 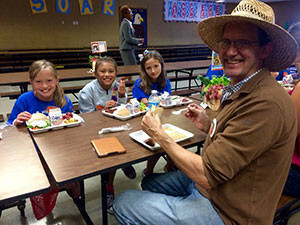 The California Thursdays program, part of a district initiative that includes meatless Mondays and school gardens, is a collaboration with the nonprofit Center for Ecoliteracy. It’s all part of a larger picture, California Food for California Kids that the center believes can serve as a national model for healthier cafeteria eats. San Diego, McNamara says, has a natural advantage. “Not only are we blessed to be in California, but San Diego County has the highest concentration of organic farms of any county in the United States. The variety is incredible. We get to work with farms of all sizes; for example, our November Harvest of the Month item is persimmons purchased from Sahu Subtropicals, a 60-acre farm in Fallbrook, California. We get our kumquats from them too.” The district spends around 5 million a year on produce. The logic behind California Thursdays, according to the Center for Ecoliteracy, is to start with attainable goals: “The goal of serving one freshly prepared meal per week is an achievable step,” notes the CEL on its website. “At the same time, it requires changes throughout nutrition services operations.” The California Food for California Kids program began with a pilot in 2013-14, rolled out in 15 districts in 2014, is in place in 42 this fall and is expected to expand even further in spring 2016. 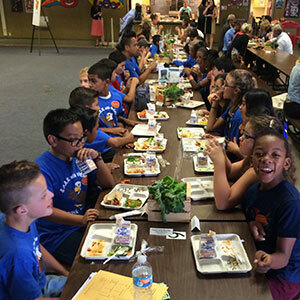 In San Diego Unified, students are involved in the menu selection process through focus groups and taste tests, work in the school gardens, and can view menus on an app called Yum Yummi that keeps them up to date on the latest choices from the “Kids Choice” and “Sandi Coast” cafes – items like the Strawberry Sun Sandwich, which combines local strawberry jelly and sunflower seed butter on star-shaped whole grain bread, or mac and cheese with whole grain noodles and local cheese. It’s far cry from the lifeless canned veggies and mystery meats most of us remember eating in the school cafeteria in the latter 20th century, and the Center for Ecoliteracy assists districts with marketing and communications materials to help get the word out. As far as McNamara and her coworkers are concerned, it’s an idea whose time has come.